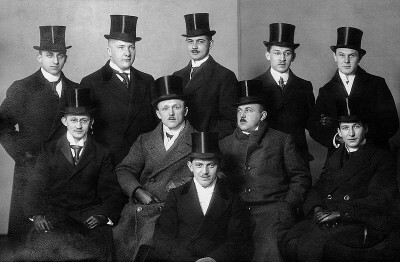 Typical public radio board members: 66 percent of NPR affiliate board members have the same gender, 72 percent have the same ethnicity and 75 percent represent the same social class as these gentlemen. For a public radio service, NPR is notoriously known for its lack of diversity within its staff, audience and guests invited onto their shows—problems that NPR has itself acknowledged (6/30/14). 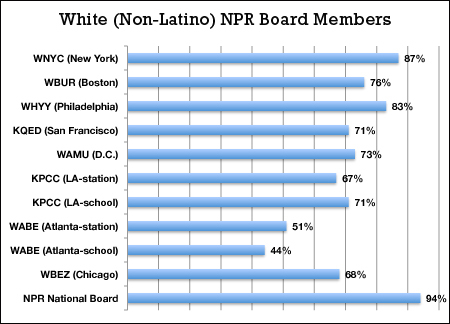 A new FAIR study finds that NPR’s diversity problem also extends into the board of trustees of its most popular member stations: Two out of three board members are male, and nearly three out of four are non-Latino whites. Fully three out of every four trustees of the top NPR affiliates belong to the corporate elite. FAIR studied the governing boards of the eight most-listened-to NPR affiliate stations, based on Arbitron ratings (Cision, 2/13/13). The stations and their broadcast regions are KQED (San Francisco), WAMU (Washington, DC),WNYC (New York City), KPCC (Los Angeles), WHYY (Philadelphia), WBUR (Boston), WABE (Atlanta) and WBEZ (Chicago). (Two top-rated public stations, KUSC in Los Angeles and WETA in Arlington, Va., were not included in the study because they mainly play classical music rather than having a news/talk format.) Board members were coded by occupation, ethnicity and gender. Out of the 259 total board members, 194—or 75 percent—have corporate backgrounds. Many of these board members are executives in banks, investment firms, consulting companies and corporate law firms. Some of the elite corporations include Verizon, Bank of America and Citigroup. Of the board members with corporate occupations, 66 are executives in the financial industry. Another 22 are corporate lawyers. Eleven other members appear to be board members by virtue of their family’s corporate-derived wealth, usually with a primary affiliation as an officer of a family-run charitable foundation. Of trustees with non-corporate occupations, academics are the most common, with 18 individuals—just 7 percent of total board members. Thirteen were coded as leaders of nonprofit organizations not affiliated with family-run foundations. Corporate-affiliated board members were a large majority on virtually every board. New York’s WNYC has the most, with 90 percent corporate representation, followed by Boston’s WBUR at 83 percent. The board of Philadelphia’s WHYY is 80 percent corporate-tied, the Bay Area’s KQED is 79 percent, Chicago’s WBEZ is 76 percent and Washington, DC’s WAMU is 73 percent. Two stations, Southern California’s KPCC and Atlanta’s WABE, are affiliated with educational institutions. Both stations are governed under a partnership agreement where two boards share responsibility: the educational institution’s publicly elected board that holds the station’s broadcast license along with the board of a nonprofit entity that manages the station’s day-to-day operations. In KPCC‘s case, Pasadena City College’s Board of Trustees is 29 percent corporate-affiliated, with an equal number of academics, while the board of Southern California Public Radio is 71 percent corporate. WABE is governed by the Atlanta Board of Education (44 percent corporate) and the American Educational Telecommunications Collaborative (60 percent corporate). Although the Pasadena City College board and the Atlanta Board of Education do not have a majority of corporate occupations, corporate occupations are still the most common on each board. 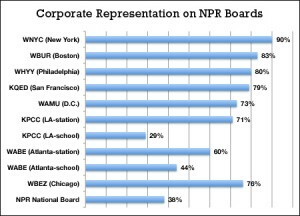 The corporate composition of the NPR affiliate boards are in line with a previous FAIR study that found that the governing boards of leading public television stations—most of which are PBS affiliates—are stacked with 84 percent corporate board members overall (Extra!, 10/14). NPR president and CEO Jarl Mohn claims he wants to ask “wealthy donors” for more money and double revenue from corporate underwriting to stabilize NPR’s financial status (NPR, 10/17/14). What easier way to accomplish these goals than by having governing boards dominated by wealthy individuals from the corporate sector? Of course, the inevitable consequence of this is to put legal control of what is supposed to be public radio into the hands of a tiny, highly privileged fraction of the population. As evidenced in stations’ annual fiscal year reports where major donors are listed, many of these wealthy and corporate-connected board members are relied upon to regularly donate thousands of dollars to their respective stations. For example, an executive from Capital Group International sits on their board of KPCC, while the Capital Group Companies Charitable Foundation donates between $100,000-$249,999 to KPCC. Washington DC’s WAMU was the only station to reveal how much of its revenue specifically comes from corporate underwriting—38 percent (WAMU-FM, 10/8/14). With wealthy donors representing the One Percent class making up a substantial portion of contributions from the “public,” it’s hard to see what essentially distinguishes National Public Radio from its explicitly commercial media counterparts–and what justifies NPR and its affiliates receiving public subsidies via the federally funded Corporation for Public Broadcasting. 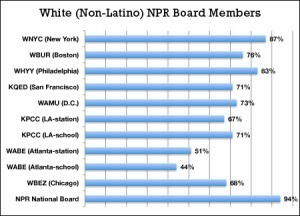 In addition to a lack of occupational diversity, NPR’s governing boards also suffer from a lack of ethnic and gender diversity. Out of 259 board members, 186 (72 percent) are non-Latino whites. Among members who are people of color, 31 are African-American (12 percent), 23 are Asian-American (9 percent), 12 are Latino (5 percent) and one person of Middle Eastern descent. (Six members’ ethnicities were unidentifiable.) Aside from Native Americans, none of whom could be identified on the NPR boards, the most notably underrepresented ethnic group are Latinos, who were 16 percent of the US population in the 2010 census. The overwhelming dominance of corporate white males on NPR affiliate boards sheds light on NPR’s 2014 cancellation of Tell Me More, a program focused on issues facing minority communities that fell victim to NPR budget cuts and low ratings. The decision to to cancel the program was ultimately made by NPR’s national board of directors. (See below.) But a Columbia Journalism Review article (6/5/14) argues that NPR member stations—some included in this study—are also partially responsible for the show’s demise, either because of the stations’ reluctance to promote the program or giving it a bad time slot. WNYC, which aired Tell Me More, has 87 percent white board membership—the most among the stations studied. Among other stations that carried the program, WHYY has 83 percent white membership, followed by WAMU at 73 percent and KQED’s 71 percent. Among the stations that did not air Tell Me More, WBUR in Boston has a 76 percent white board, and WBEZ’s is 68 percent. Tell Me More also focused on women’s issues and was aired on stations with mostly male board members.WAMU has 69 percent male membership, followed byWHYY‘s 67 percent. KQED stands at 64 percent male membership while WNYC has 54 percent (out of the 18 women, six were tied to a corporate spouse). 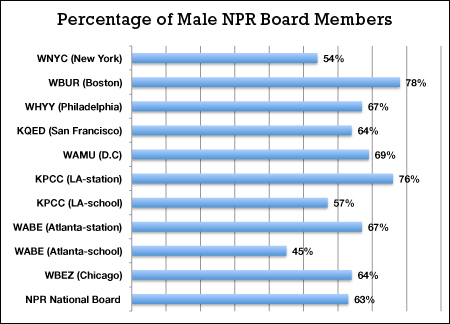 The boards of WBUR and WBEZ, which did not air Tell Me More, are respectively 78 percent and 64 percent male. With so many board members drawn from corporate America, the NPRaffiliate boards were virtually bound to demonstrate a lack of ethnic and gender diversity. Fortune magazine (2/4/14) found that less than 5 percent of Fortune 500 CEOs are people of color, and a similar percentage are women (Fortune,6/3/14). 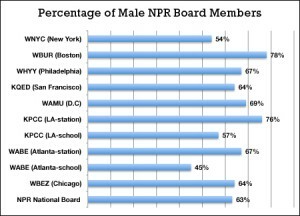 It’s hard to believe in public radio’s stated commitment to diversity when it stacks its governing boards with white men overwhelmingly drawn from the ranks of the corporate elite. While a majority of the board is populated by NPR station managers with backgrounds in public media, the rest of the board members have strong ties to the corporate sector. This includes NPR CEO Jarl Mohn, who has an extensive background in commercial media, having held executive positions within E! Entertainment, MTV and VH1. Additionally, NPR Foundation chair Howard Wollner is a retired Starbucks senior vice president. All four of the so-called public members represent the corporate elite; three of them are executives in the financial industry. Male board members outnumber women 10 to 6 (63 percent male). Fifteen of the board members are white (94 percent, more ethnically homogeneous than any of the station boards studied), while only one—Caryn Mathes—is African-American. Aldo Guerrero is a graduate of Montclair State University in New Jersey and a former FAIR intern. His article “Who Rules Public TV?” (Extra!, 10/14) looked at the composition of public television boards. Follow him on Twitterat @AldoAntho. You can send comments to NPR ombud Elizabeth Jensen via NPR‘s contact form or via Twitter: @ejensenNYC. Please remember that respectful communication is the most effective.